eating the applesauce we made! This week we did a lot of fun activities with apples. 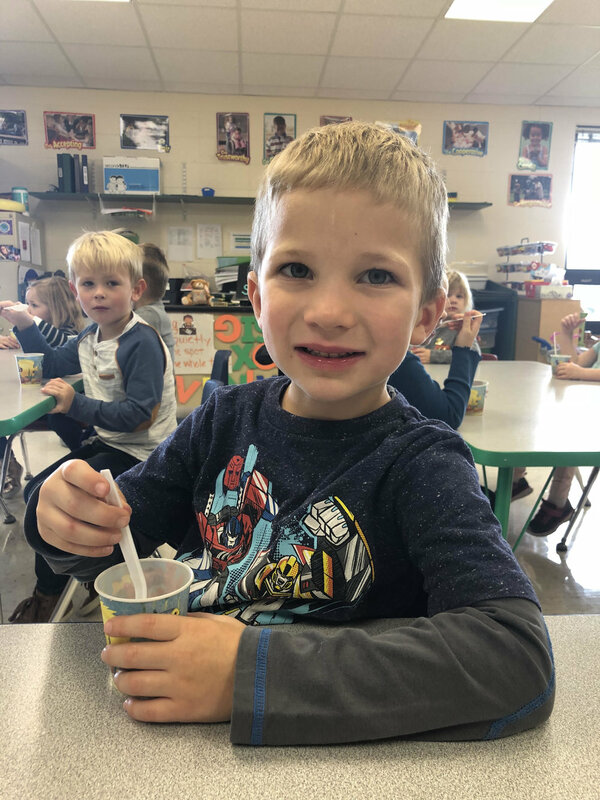 We made an apple pattern frame, made a class book called “Apples up on top”, did an apple tasting with graph to show our favorite apples, and made applesauce! We also learned the letter Ff. In second step we learned strategies to help us follow directions. In gym, we practicing running and kicking a soccer ball. Next week, we will be learning letter Ee. We will be sponge painting leaf and pumpkin pictures, sorting apples and pumpkins by size, number matching, and making a book called “Scarecrow, Scarecrow” similar to brown bear, brown bear. Coloring contest pictures are due by today. Pictures can be dropped off at school or at Kohlsville Fire Dept. WHOLE SCHOOL BREWER/PACKER DAY is Monday, October 15th. Wear your favorite sports app areal.